It happened to be dumb luck that I picked this one, but this workout is a perfect combination of strength and cardiovascular conditioning, matching push vs. pull and really testing my endurance. The idea here is not to pick a workout that's going to leave you sore for days like mine happened to do this time around, but more to track progress year over year as you continue to better yourself physically and mentally. Don't accept the fact that with each year you're just expected to put on weight, slow down, and lose strength. That mindset is an automatic response that provides you with a perfect excuse to not challenge yourself. Don't go down without a fight and get better every year by getting better every day. So, pick a birthday workout for yourself. It can be anything - 5k run (or for an even tougher challenge: a 5k row! ), 100 burpees for time, max pushups in two minutes, or maybe even an obstacle race. Do it this year, record your results somewhere you'll remember, and try your hardest to make sure you beat your previous birthday's time. It's all about setting a goal and experiencing that sense of achievement when you accomplish it! And while you're at it, take off work on your birthday. I sat at my desk this year, like I do every other workday, and regretted not doing something cool and memorable. You only get one day a year that's YOURS. Make it count! 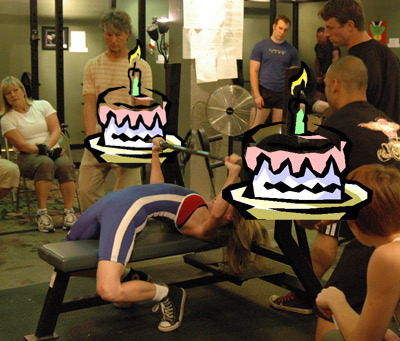 What will your birthday workout be?